Banking customers please sign in here. Brokerage customers please sign in here. Global TradeStation and Global TradeStation Pro are currently undergoing a potential change of technology provider and custodian. Please contact us from May 15, 2019, as we expect to have a more comprehensive update at that time. New applications for MetaTrader 4, our other platform dedicated to FX and CFDs, will not be affected and is operating as normal. Designed to be fast and as easy-to-use as possible, the new Global TradeStation platform is a web-based platform that can be used from any HTML5-compatible web browser, from any device. Global Trading’s new Global TradeStation (GTS) is the world’s most intuitive multi-asset trading platform. Clients can manage their portfolio easily on any device from a single account, while viewing market prices on more than 30,000 instruments across FX, CFDs, Futures, Options and Stocks. Move seamlessly between devices thanks to the latest HTML5 technology. Access over 30,000 instruments in multiple assets classes anywhere, anytime on any device. Place orders and monitor positions anywhere you go. Trade from the watchlist, the dedicated trade ticket or directly from the chart in real time. Apply technical analysis and annotations in just a few clicks with the brand-new charting package. Execute FX and CFD trades on guaranteed green prices with low slippage*. * In normal market conditions. Learn more about the new Global TradeStation here. Trade securely from your desktop PC and access institutional level trading tools. Global Trading offers the downloadable Global TradeStation Pro (GTS Pro), the most professional and complete multi-product online trading platform on the market. 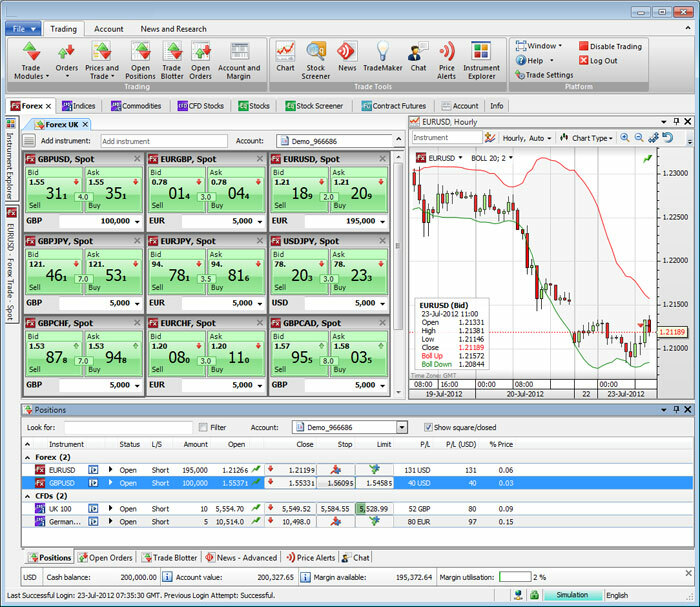 The Global TradeStation Pro combines a highly secure environment with award-winning speed and a massive choice of trading modules. 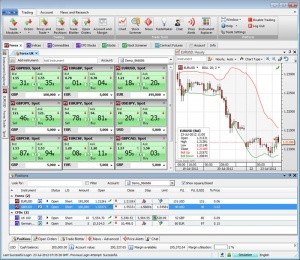 Global TradeStation Pro helps clients make trading decisions with real-time execution. Easily downloadable, the Global TradeStation Pro allows investors to trade thousands of instruments across multiple asset classes from a single account. Complete product range – 160+ FX crosses (incl. Spot Gold/Silver), 8,400+ CFDs, 16 Index-tracking CFDs, ETFs, Stocks from 20+ exchanges, as well as FX Options, Futures contracts and other derivatives. Fully customisable trading environment, complete with prices, market analysis, data and news modules, technical analysis and charting functions. Excellent liquidity, one-click trading for fast execution and full range of trade & order functionality. Enjoy world-class liquidity, execution and offshore trading on the popular MetaTrader 4 platform. Whether you place every trade yourself, or prefer algorithmic trading through Expert Advisors, you will experience Tier1 liquidity and execution through your offshore account. Now you can trade offshore using your favourite trading platform. Get started and open an account today. Trade margin products – 30+ FX crosses and 23 CFDs with leverage up to 200x*. Algorithmic trading through Expert Advisors – no restrictions on EAs. Liquidity and speedy execution delivered by Tier1 banks. Industry leading spreads as low as 0.8 pips. Delivered by Euro Pacific Securities (Global Trading), a wholly-owned subsidiary broker of Euro Pacific Bank. Learn more about trading on MT4 with Global Trading here. Euro Pacific Intl. Bank Inc. is licensed and regulated by the Office of the Commissioner of Financial Institutions (OCIF) in Puerto Rico as an International Financial Entity (license # IFE-033). International Financial Entities (IFEs) are licensed and regulated by the Office of the Commissioner of Financial Institutions pursuant to Act No. 273 of September 25, 2012, as amended (the IFE Act) and Regulation No. 5653. Euro Pacific Intl. Bank Inc. is authorized to trade as Euro Pacific Bank. Euro Pacific Bank is not insured by the FDIC in the United States. All of the banking products offered on this website, including bank accounts, payment services, foreign exchange, card services, deposits and precious metals are offered exclusively through Euro Pacific Intl. Bank Inc in Puerto Rico. Brokerage and investment products and services, including products offered on Global TradeStation (GTS) and MetaTrader 4 (MT4), are offered through Euro Pacific Securities, Inc., a licensed broker dealer in the British Virgin Islands (certificate # SIBA/L/17/1112). Euro Pacific Securities holds an Investment Business License issued by the British Virgin Islands Financial Services Commission in multiple categories including: Category 1: Dealing in Investment (Sub-category A: Dealing as Agent, Sub-category B: Dealing as Principal) and Category 2: Arranging Deals in Investments. Euro Pacific Securities, Inc. is authorized to trade as Global Trading. Proprietary mutual funds are offered through Euro Pacific Funds SCC Ltd., a licensed public mutual fund company in St. Vincent and the Grenadines. Fund and investment advisory services are offered through Euro Pacific Advisors Ltd., a licensed fund management company in St. Vincent and the Grenadines. Euro Pacific Securities, Inc., Euro Pacific Funds SCC Ltd., and Euro Pacific Advisors Ltd., are all wholly owned subsidiaries of Euro Pacific Intl. Bank Inc., but are not governed by the laws and protections of Puerto Rico or the United States. © Copyright 2019 Euro Pacific Intl. Bank Inc.. All Rights Reserved. This Website is intended for the use of NON United States or Puerto Rican citizens or residents. The products and services provided on this website are not intended for use by any individual or entity in a country where the use would be contrary to law. Certain products and services offered on this website may have legal and or regulatory restrictions and may not be available in all geographical jurisdictions. The information contained on this website is intended for informational purposes only and is not a solicitation for any products or services. I am NOT a United States or Puerto Rican citizen or resident. I am a United States or Puerto Rican citizen or resident.